Last week I got to the press conference for the announcement of this major initiative. I’m glad I did because it really rammed home just what a ridiculous position we are in when 80% of professional dancers suffer an injury each year that stops them working… and for many they have no way to get treated by specialists fully aware of dance and sports injuries. And access to the right specialist at the right time can mean the difference between continuing to dance and a career needlessly foreshortened. Ultimately, as Caroline Miller (Dance UK Director) summed up, “This is about keeping dancers on stage dancing to their ultimate ability.” The 6 institutions involved aim to bring down the rate of injury with research, and put in place a system that gives every dancer in the country (freelance or otherwise) the ability to access good medical support for the first time. For dancers the immediate benefit is the opening of a special NHS dance clinic at the Royal National Orthopaedic Hospital in central London. Any professional dancer will be able to access the clinic via their GP – specific details on how to do this are on the Dance UK website. It was stressed that this is for all dancers and not just those who do contemporary dance or ballet – hip-hop, ethnic, jazz etc – the only test is if the dancer is professional. Although NIDMS are starting with one clinic the hope is to see other clinics formed around the country, taking treatment to where it is needed. Until now dancers, outside well-funded companies like the Royal Ballet, have effectively had to sort out their own treatment, and Rosie Kay spoke eloquently about getting an injury that probably cost her a year out of her dance life and to get the correct doctors cost £10,000 spread over 3 operations – she is still paying off for the last lot of surgery now. And this in a profession not renowned for its high pay. The press release says much more about NIDMS – full of examples, it’s a good read. With so many dancers being touched by injury each year this initiative should have a profound impact on the profession and seems long overdue. Congratulations to all involved in getting it off the ground. On Monday 30 April over 200 dance professionals join dance medicine and science leaders at the Royal Society of Medicine to celebrate the opening of the National Institute of Dance Medicine and Science. The National Institute of Dance Medicine and Science (NIDMS) provides a radical new approach to dancers’ healthcare which is one of the most pressing problems facing the growing industry. Injury treatment costs the subsidised dance sector on average £900,000 a year and £1 million in lost time. This problem impacts the entire industry. This initiative is the result of a visionary partnership between six major dance organisations, universities and a hospital and five years of fundraising. The founding partners are Dance UK, Birmingham Royal Ballet’s Jerwood Centre for the Prevention and Treatment of Dance Injuries, Trinity Laban Conservatoire of Music and Dance, University of Wolverhampton, University of Birmingham and the Royal National Orthopaedic Hospital. Together, these institutions employ world leading experts in dance medicine and science, research, education and treatment. At the launch the group will announce the initial phase of the National Institute which includes the opening of the first specialist dance injury clinic embedded in the NHS, based at the Royal National Orthopaedic Hospital (RNOH) in London. Dancers will be able to access the clinic free via their GP. The vision is that after establishing the first NHS clinic, further funds will be raised to support the creation of similar services where there are concentrations of dancers across the UK over the next five years. The clinic has already treated several dancers including providing speedy specialist treatment and an operation, via the NHS, for an injured dancer who was performing in ZooNation’s Some Like It Hip Hop at the Peacock Theatre. Dancers can also access specialist private treatment through the dance medicine and science services at Trinity Laban and Birmingham Royal Ballet’s Jerwood Centre for the Prevention and Treatment of Dance Injuries. Central to NIDMS is its plans to undertake research. The NIDMS partners have designed a large-scale, prospective, epidemiological research project, which is needed to fully understand the multi-dimensional causes of injury in different populations of dancers, and the best strategies for preventing and treating them. This project will be the first of its kind on this scale in dance in the world. It will have an observation – intervention – observation design. Analysis of the data collected will enable the dance sector to develop optimal injury prevention and fitness programmes for dancers working and participating in a variety of contexts, helping to reduce the rate of injuries and get dancers back performing more quickly. This research element of NIDMS will be led by the dance science departments at Trinity Laban Conservatoire of Music and Dance and University of Wolverhampton, and the Dance Psychology Research Group in the School of Sport and Exercise Sciences and the School of Psychology at University of Birmingham, working together with the teams at RNOH and Birmingham Royal Ballet’s Jerwood Centre for the Prevention and Treatment of Dance Injuries. Existing research shows that 80% of professional dancers suffer an injury every year that stops them working. Like elite athletes, dancers push their bodies to physical extremes to achieve high level performances, yet only the biggest dance companies can afford in-house health teams. The majority of dancers are low paid freelancers who cannot afford private health insurance and the threat of injury and lack of affordable, accessible specialist healthcare is one of a dancer’s biggest fears. 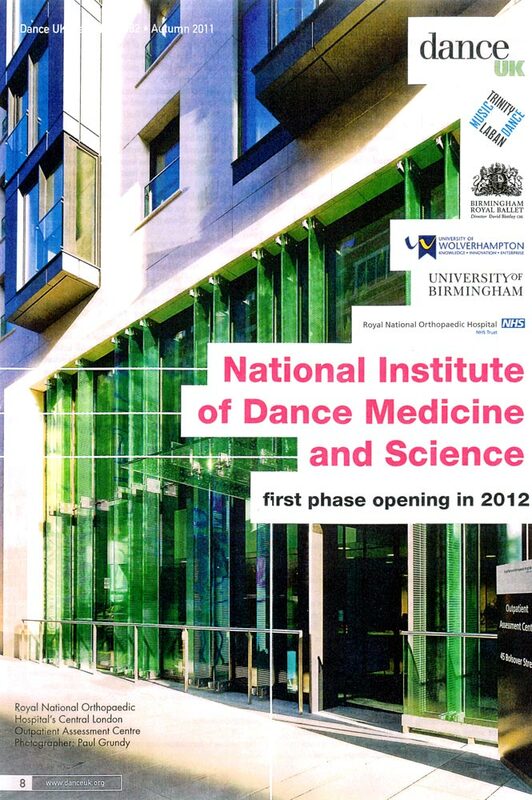 This is why the creation of the National Institute of Dance Medicine and Science is so important to dancers. The creation of NIDMS has been made possible by major donations by the Jerwood Charitable Foundation and British Harlequin plc, with generous support from the Society of London Theatres and Theatrical Management Association, and Trinity College London. Many donations have also been made by members of the dance industry. Over 140 individuals made donations as part of The Big Give and Tony Shepherd, PR and Marketing Consultant, ran the 2012 London Marathon in aid of Dance UK’s dancers’ health work and raised over £2000. Long-term fundraising is ongoing to deliver and sustain the vision of NIDMS. Dance UK, the support body for the professional dance sector, brought together the NIDMS founding partners after it published the last national survey of dancers’ injuries, Fit to Dance 2 in 2005. Findings included that 80% of dancers suffer an injury that stops them working each year. As a result of this report, industry leaders including dance companies, educational institutions, academics and dance medicine and science specialists united to call for the sector to pool resources and work together to create shared specialist health hubs. This was in recognition that most dance companies, (apart from the major ballet companies) could never afford comprehensive specialist health provision for dancers in house. This led to the creation of the NIDMS partnership which has also consulted closely with the British Olympic Medical Institute and sports science experts.